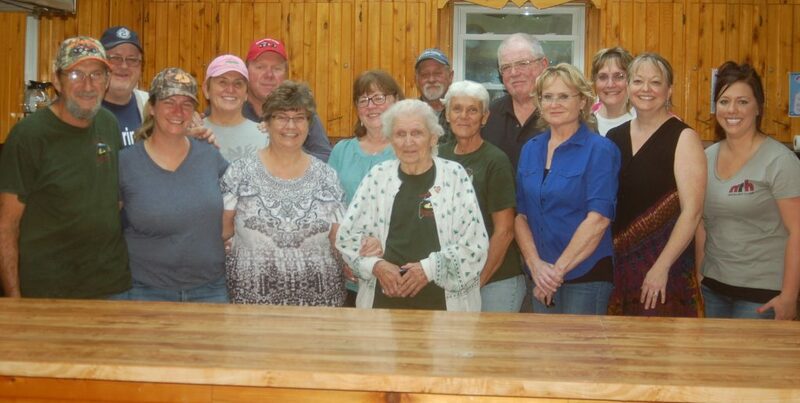 MILLINOCKET – When the Northern Timber Cruisers put on a benefit supper, they don’t fool around. Last Thursday, the club opened their 2018/2019 public supper season with a bang. The proceeds for this event went entirely to the Millinocket Regional Hospital’s oncology clinic renovation project. And when it was all over, the club raised over $2,300. One of the volunteers who played a major role in the dinner was Arnold Madore. Madore says he was approached by Dave Moore and John Raymond about the idea for the club’s first supper and the goal of having it benefit the hospital. “I told them I was interested, and yes I would do it,” he said. “The club has a great reputation for its suppers thanks to the cooks who have gone on before me, and everyone has been ready for us to start doing them again,” Madore said. Madore’s wife, Trish, said she was stunned and then thrilled at the response. Between 150 and 175 people took part in the supper. The early diners feasted on a roast turkey dinner with all the “fixings”; Trish said that they used three roasters and four ovens to cook the turkeys. With over 100 pounds of potatoes, 40 pounds of carrots, 30 pounds of corn and 11 turkeys averaging 23 pounds each as well as stuffing, gravy and more, it was quite a surprise to those involved that they ran out of food early on. “The dinner began at 4 p.m. and we were sold out before 5 p.m.,” said Katie Mackin, marketing director for MRH. “We expected to sell out, but not that early,” she said. Over 16 volunteers from the club worked with eight people from the hospital to make the dinner the success that it was. Local favorite, 97 years young Natalie Voisine, welcomed attendees at the front door and sold 50/50 raffle tickets. The winner of the raffle was Marion Fowler who donated the money back to the hospital with the assurance of another donation in addition to that one. The money raised will be added to the renovation fund at MRH to upgrade the oncology clinic. Mackin had high praise for the club and its members. “Words can’t express how grateful we are for the club, their volunteers and their generosity. Not only did they provide the space and the ingredients for the meal (so that all of the proceeds could go directly to the Oncology Clinic project), but they also invested a great deal of their time to create a delicious dinner on our behalf….The club’s volunteers are extremely dedicated and have a strong work ethic, but they are also a lot of fun. We really enjoyed teaming up with them for this event!” she said. Looking ahead, the Northern Timber Cruisers are preparing for their next culinary feast: a New England boiled dinner. The supper will be held on Thursday, October 18, from 4-6 p.m. and the proceeds will go to benefit the club. Take outs will be available. Madore said that if anyone has any questions, they contact him at 447-8329.